USB Data Theft Protection Tool is usb traffic monitoring program to capture and display overall malicious activities of the USB mass storage devices configured on your PC. Software provides details of USB storage devices including system details, user details, USB details and network details etc. USB activity monitoring tool monitors connection and removal activities of USB storage devices. Software provides facility to restrict users from unauthorized access of important information, confidential files and folders, stored data etc. through USB drives. USB monitoring software facilitates administrator to change the access and permission settings of the USB port devices. You can send text log of recorded data and image captured by camera via Email settings. Software provide facility to upload log files and captured image via FTP server. USB data theft protection tool is capable to capture photos of unauthorized user if camera is enabling on your PC. software provides export and import settings facility which allows users to export current settings to file and import saved settings from file. Software Provides USB Access Settings to enable or disable USB ports on your pc which prevents unauthorized access. USB Monitoring Software provides Start - up setting option to run the software secretly at windows start up in hidden mode. Using Privacy Settings you can remove installed program from desktop, All programs etc or you can also hide the program folder. Using Log Settings, You can specify the maximum size of text log from 10 KB to 2048 KB. When specified size limit achieves, the backup file of log will be created. Software provides facility to view text log details of connected USB media device in Standard or Deatiled Format using Log Format. 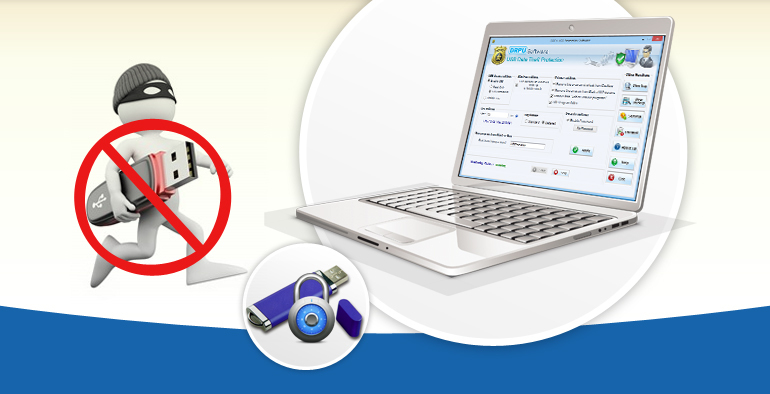 USB Data theft monitoring Software also provide facility to set or change Password with the help of security settings.